George Gervin is a true NBA and ABA legend, a four-time scoring champion, 14th all-time in total points scored between the two leagues, and the most famous practitioner of the finger roll. He played nearly his whole career in San Antonio after the Virginia Squires, his original ABA team, dealt him to the Spurs in a controversial deal some owners tried to block. The deal created one of the league’s forgotten great teams, but it also robbed the world of a prolonged look at a Julius Erving–Gervin pairing with the Squires. Gervin still lives in San Antonio, and he’s a fixture here at charity events, Spurs games, and all over the place. He has popped up on NBA TV during the Finals for some on-camera analysis, and he stopped to chat one-on-one with Grantland before Game 4. Here’s a transcript of our chat. You still live here, right? I still live in San An-tone. Never moved, never left. It’s a great place to live, man. So are you surprised the team is back in the Finals at this stage in Tim Duncan’s career? After last season, did you expect them to get another crack at that fifth ring? Oh, no, I’m not surprised. I mean, they had a chance last year to get back. But they ran into a hot OKC team. They beat ’em the first two games, and OKC got hot, and just believed they could beat ’em — and then beat ’em. San Antonio has always been around. It’s just good to see they’ve gotten over that hump again, as Tim’s gotten older, Manu’s gotten older, and Tony [Parker] gets smarter. It’s working out for them. What have you thought of the games so far? I think it has been such good basketball. San Antone went up there and beat ’em the first game. Then Miami let ’em know they wasn’t going to be a pushover and beat ’em up pretty good, and then San Antonio comes back here and let Miami know they are back in San Antone. If you don’t bring it, they have an opportunity to blow you out. What happened to the Heat in Game 3, from your view? You know, Miami just looked like they wasn’t in it. And you can be like that sometimes. You hate that, but they didn’t play Miami basketball, and they got punished for it. You’re a four-time scoring champ, so you know about the pressure of being the guy. Is it fair to target all the scrutiny at the no. 1 guy when he has a bad game, as LeBron did in Game 3? Or do we in the media sometimes fall short in crediting the Spurs’ defense — with help defenders waiting at the foul line and the rim for a guy like LeBron? You gotta credit the defense. They talk about how Kawhi Leonard is kinda shutting LeBron down. But I know Kawhi knows he’s not really shutting him down. Kawhi’s just playing the game, and that’s something you don’t want to mention — that you’re stopping one of the greatest scorers in the game, because he can come back with a vengeance and punish you. LeBron had a bad game. But overall, the Heat had a bad game, and the Spurs played superb — they set the NBA record for 3-pointers. They done something that no other team in the Finals has ever done. You gotta give San Antonio a lot of credit, and I know the way [Spurs coach Gregg] Popovich is — he’s gonna have his team ready, because Miami is gonna come out ready. 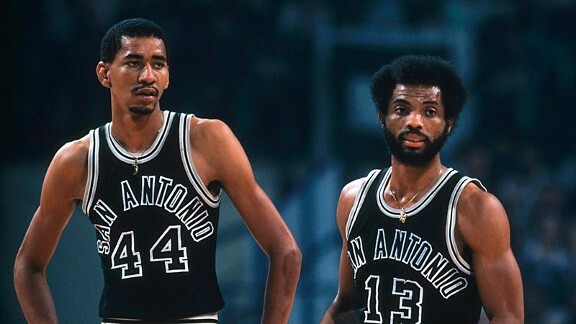 The late 1970s/early 1980s Spurs might be the best forgotten team in league history. You guys were really good every season. I think you made three conference finals, nearly got there in ’79. But I’ve never seen a great book on you guys. What should fans know about that team? We were entertainers. Once we merged [from the ABA] in’76, we had something to prove. We wanted to show the NBA fans that we belonged. We wanted to show the NBA players we could compete, and we had a lot of confidence in our abilities. One of our first years, we won 50-some games and won the conference. You know, it was just a quality basketball team. I had great teammates. I was leading the league in scoring, but I had guys like Larry Kenon, Mike Mitchell. I could get 30, and they could get 30 in the same game. We were entertainers, and we could flat-out put the ball in the basket. Tell people about James Silas [a Spurs guard from 1973 to 1981]. [Shakes head and smiles.] James Silas! I mean, his number is in the rafters here, and die-hard San Antonio fans know him. But how many NBA fans even know the guy’s name? Probably not many, which is a shame, because they are missing a tremendous basketball player. If anybody back in them days that had to guard him — if you get a chance to speak to them, they’ll tell you how strong and wise he was, and how this guy could really just flat-out score. I played with him quite a few years, and I knew down the stretch, I’d give him the ball. You’re George Gervin! You’d give him the ball in crunch time? Yeah, I’d give him the ball because I knew he could go to the foul line, and if he goes to the foul line, I could really just walk into the locker room. Because he will not miss a free throw. [Editor’s note: Silas shot 85.5 percent from the line for his career.] He was a special guy that don’t get a lot credit. I’m glad you brought him up, man. James Silas was one of the great ones. Everyone who was ever involved in the ABA has their favorite crazy ABA stories. What’s your go-to ABA tale? The 1978-79 season was probably your best shot at the ring, when you guys were still in the Eastern Conference, and before Magic’s time with the Lakers. You were up 3-1 against Washington in the conference finals, if I remember right. What happened in those last three games? Does that still stick in your craw? Being an ABA franchise, we outgunned you. We outgunned them guys the first four games and went up 3-1. You know, it’s one of the sad times in my career, because I really felt we could have won the NBA championship. But we put the cart before the horses. You got a little cocky, you mean? Oh, man. We didn’t put them guys away like we should have. They were a great basketball team, with Wes Unseld, Elvin Hayes, Bobby Dandridge — I mean, you know, we just didn’t close ’em out. That’s one of my sad times for me as a player, and for my team — not getting to the NBA Finals. You had 40-something in Game 7 of that series. Were you satisfied with your play in those last three games? Any specific possessions or shots you remember? You never do enough if you didn’t win. I wasn’t satisfied. I might have had 30 or 40, but I might have needed 50 to get it done, and I didn’t get 50. It was a shame. Being a champion is something special, and being an NBA champion is special. But I still feel like a champion. I had a great career. My only regret is not winning an NBA championship. But regret is a wasted emotion. I had my turn. I just didn’t complete it. Do we fixate too much on the whole “rings” thing? I mean, Jerry West, Mr. Clutch, nearly went his whole career without one. Lots of other great players have. It’s hard to win even one. You need some luck, some health, etc. Is it a good way to talk about the sport? Well, it makes a good conversation piece. Like you said, only one team can win a year. I went up against the Washington Bullets back in ’78-79. They won the title the year before. And then in the West, I went up against Magic Johnson and Kareem Abdul-Jabbar. I mean … them wasn’t no scrubs. You had to play some ball and be consistent to beat them guys. Unfortunately for my team, we didn’t get it done. People forget you played with Dr. J for one season in Virginia. How did that work? Did you guys share the ball? Hey, man, it was beautiful. That was my rookie year, and I went to Virginia and I played with the Virginia Squires, and the Doctor was on the team. People don’t know this, but after practice, I used to try to go into the locker room and Doc used to call me up and say, “Hey, rook! Where you goin’?” And I used to say, “I’m going to the locker room.” And he’d say, “You ain’t done yet!” And me and him used to play one-on-one. Most practices, me and him used to play one-on-one, so I credit Doc a great deal for me building my confidence and self-esteem that I could play professional basketball. He would win ’em early. But once I got my confidence I made him work. How’d you play him? He was never a great jump shooter. Right, right. I mean, I wasn’t smart enough back then to back off of him. At that time, he was so quick, and he could explode so fast, that it was hard to do anything with him. But I started my career with Julius Erving and I finished it with Michael Jordan. That’s right. You got traded to the Bulls at the end of your career. And you had a couple of seasons in San Antonio with Artis Gilmore, too. Yeah, I played with Artis for three years. He was part of that dynasty that we had to try and get by the Lakers. [Editor’s note: The Lakers beat the Spurs 4-0 in the 1982 Western Conference finals and 4-2 in the 1983 conference finals.] We felt once we got Artis, that we really had a good chance to beat them guys. And we made them guys scared of us. Oh, I know we did. You can ask them. I ain’t gonna say they was a better team. I’ll say they played better in the series. You barely ever shot 3-pointers in your career. Would you shoot a lot of them if you played today? No. That’s the worst shot in the game. Come on! You played in the ABA! Which player today reminds you the most of you? That’s always the most popular choice. Something must resonate with people who know your game. He can flat-out shoot the ball. He can put the ball on the floor. He’s working on his in-between game. He doesn’t have that little left- and right-handed hook like I did, but once he adds that to his repertoire, he’s gonna really be unstoppable.